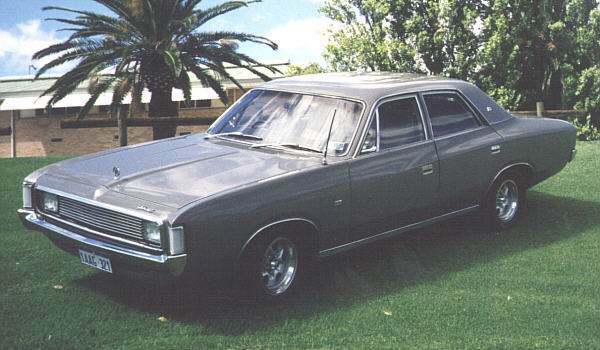 Chrysler Australia released the VH Valiant range in June 1971. 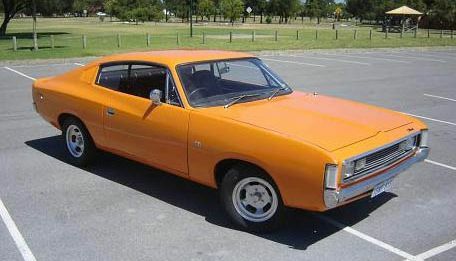 The VH was the first 'All Australian' Valiant and was a major change from the preceding VG range - with larger cars, which were styled to look even larger than they were. The grill treatment on the new VH range was a direct design decendant from the US Mopars with the central recessed area for grille and headlights, which was surrounded by uninterupted trim on the outer leading edge of the whole assembly. The smaller rectangular headlights from the previous VG range where also retained. The VH model range also saw the introduction of the new luxury class vehicles, the "CH" range. The CH was a further 4 inches longer in the wheelbase than the VH Valiant (115 inches over 111 inches), with a total length of 197 inches. It received a unique quad-headlight front end and also a different rear end treatment, and had higher equipment levels. The CH or "Chrysler by Chrysler" as it was named, was a four-door luxury model intended to compete with the Holden Statesman and the Ford Fairlane for the luxury car market in Australia. Also released in October 1971 was a 2 door version of the CH which was called the Chrysler Hardtop, and shared the same wheelbase as the Chrysler by Chrysler, along with the front and rear end treatment. There was also a VH Valiant Hardtop, which had the same basic body as the CH Hardtop, but with the VH Valiant front and rear end. 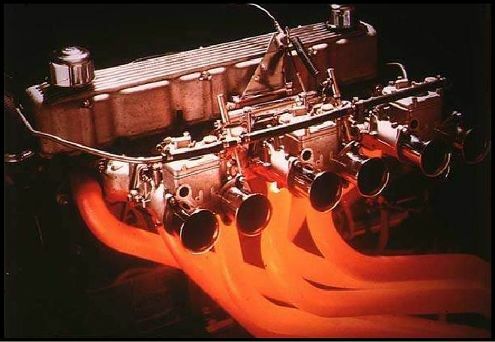 In the engine department, the in line 6 cylinder Hemi engines were once again slotted between the VH's chassis rails, but this time the news was more cubes resulting of course in more power. The new Hemi was now out to 265 cubic inches and up more than 35HP on the old 245ci, resulting in 203HP for standard 256 Hemis. Add to this more torque than the old motor aswell and the 265 Hemi would cement it`s place in history, but there was even more power to come from the new Hemi, which would see it take on many different guises throughout the VH performance range. The 318 V8 was still the standard option V8, however the Chrysler by Chrysler could also be optioned with the 5.9litre 360 V8, producing 265hp. On the performance front, the Pacer was once again offered for the VH range, but this time only in a 4 door. A total of 1647 Pacers were produced and apart from lively paint, menacing bonnet blackouts and striping, the new Pacer featured a higher performance version of the 265 Hemi 6 cylinder, with 218 bhp @ 4,800 rpm and 273 lb-ft @ 3,000 rpm. The Pacer could rocket down the quarter mile in 15.9 seconds, get to 100 km/h in 7.6 seconds and reach a top speed of 185kmh. 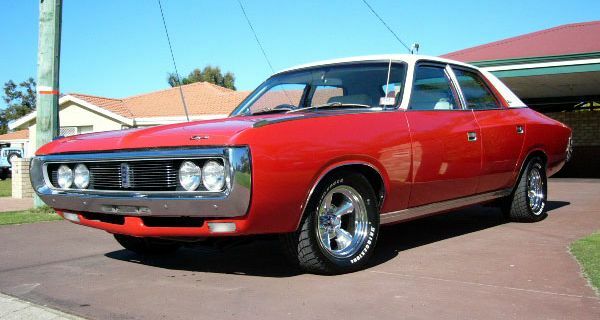 In fact, at it`s release, the VH Pacer set the record for being the fastest mass-produced four-door sedan with a six-cylinder engine manufactured in Australia, a record which stood for 17 years! But the Pacer's days as the VH performance model were numbered, because that same year saw the announcement and introduction of what was to become Chrysler Australia's most recognised new car - The Charger. The new Charger was unlike anything that had come before and it had the Australian motoring press saying thingsa like "...the most handsome car Chrysler has ever produced, and probably the best looking car ever produced by an Australian manufacturer". A short wheelbase, fastback coupe with an aggressive wedge-like stance, the Charger's design gave the effect of speed, even when it was standing still. Chrysler's TV campaign for the Charger featured the young adults at whom it was targeted, waving at one as it swept by them and shouting "Hey, Charger!" - one of the more memorable TV ads of the time, it created a clich� that haunts today's owners... Charger won Wheels magazine's Car of the Year award for 1971 and was widely acclaimed by others of the motoring press, as well as the public. This Charger came in four model guises - standard, XL, 770, or the all muscle R/T. The first of the serious track pack R/T Chargers was the E38. Despite being hampered by a three speed gearbox, it still drew comments from "Wheels" magazine like, "we achieved a time of 14.8 seconds for the quarter mile -- on smoother surfaces the Charger galloped away so easily that a best of 14.5 seconds is with in reach". The most well recognised performance Chargers were the '6 Packs'. The term '6 Pack' denoted the Triple Weber 2BBL carburettors (3x2=6) that were hung off the side of the 265 Hemi, which produced levels of power unheard of on a naturally aspirated 6 cylinder at the time. E38 Charger versions featured a 265 Hemi which produced 280 HP while the E37 and E48 were the street "six-packs". E38 was a race ready Charger with the A84 "TrackPack", which included a 35 gallon fuel tank. The A87 "TrackPack" included all the race track goodies with the exception of the big tank for endurance racing. Then in 1972 the E38 was superseded by the more powerful and greatly refined 4-speed E-49 Charger. This drew comments from Wheels such as "The raw quivering power is instantaneously on tap and with a ratio for every conceivable situation the Charger just storms through. It would take a Ferrari Daytona with racing driver Jackie Ickx at the wheel to stay with one". All E-49's came with the "TrackPack", and 21 also had the huge fuel tank in the option list which took up nearly all available boot space. The E49 "six-pack" engine came with a baffled sump, tuned length headers, special shot-peened crankshaft, conrods, pistons, rings, cam, valve springs, a twin plate clutch and of course the triple 45mm dual throat Weber carburetors. Chrysler quoted this engine as producing 302 HP which, in a 1372 KG (3000 pound) car, made for rapid acceleration. The E49 was the ultimate Charger, with only 149 built the E49s are still widely considered today as one of the greatest Muscle Cars ever produced. Road tests of the era recorded quarter mile times of between 14.1 and 14.5 seconds. 0-100 mph (160 kph) in 14.1 seconds was the norm. This compares to times of between 15.2 and 15.6 for the next quickest accelerating Australian muscle car, the mighty XY GTHO Falcon. Although the 6 Pack Chargers were the dominant players in the VH Range, there was another Charger, the 275 bhp, 340ci V8 powered E55, that came close. With only 125 units produced, this makes the E55 an extremely rare car. The E55 could reach 60mph/100kph in 7.2 seconds and complete the quarter mile in 15.5 seconds - all topped off by a top speed of 122mph! A total of 67,800 VH Valiants were built.